The magnificent Caves of Canelobre are situated near Busot, around 24 kilometres from the city of Alicante. The caves are one of Spain’s largest and deepest cave systems. These caves are believed to date back to 740AD. However, is might have taken more than seven million years for the caves to take their present form. They are still changing gradually, at a rate of 1 centimetre every 100 years. For tourism purpose, the stalactites and stalagmites are illuminated with clever lighting. 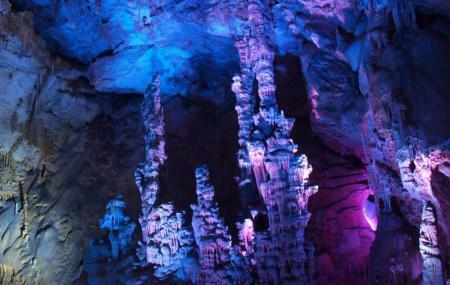 The main attraction of the caves is the candelabra formation. The caves can only be visited as part of a guided tour. Within the caves is a small picnic area. Fun Fact- the acoustics within the cave are so good that concerts are held there on occasion! Remember to carry warm clothes as it is cold inside the caves. Carry snacks with you and have a nice picnic within the caves. Entry is free for children under five years. Renting a car or hiring a taxi is recommended. Local tour companies can organize the trip for you. How popular is Canelobre Caves? People normally club together Alicante Museum Of Contemporary Art and Guadalest Valley while planning their visit to Canelobre Caves.